Accepted Scientific Name: Euphorbia caerulescens Haw. Blooming habit at le jardin exotique de Monaco.It is a great looking blue stemmed Euphorbia freely branching with many stems raising from the ground. It is characterized by periods of rapid growth, designated by the wide sections, and minimal growth which are the narrow sections. Habitat: Occurs on rocky outcrops mostly on northern slopes of hills and mountains, occasionally found on hilltops and in other habitats. It grows with rich a variety of succulent species, but grasses are uncommon. It is often the dominant or sub-dominant species of much of the vegetation which practically covers large tracts of country. 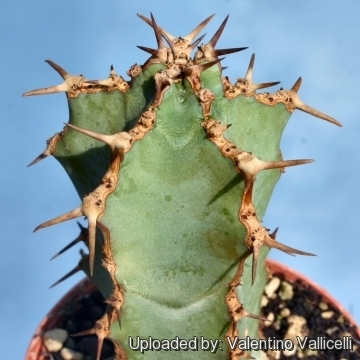 Description: Euphorbia caerulescens is a small, columnar, thorny, leafless, succulent shrub with a pretty irregular shape. 0,5- 1.5 m tall that can sucker to nearly as wide. 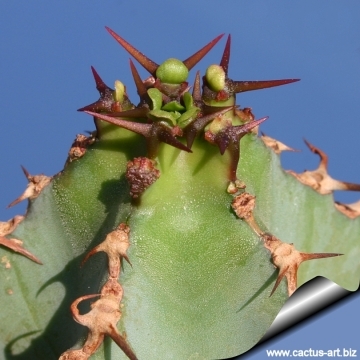 It forms a tufted crown of thick, cactus-like, short branches divided into many joints spreading by underground. Leaves: Small, ephemeral, only present on young growth. Flowers: Inflorescences (Cymes) with 1 to 3 yellow flowers (cyathia) borne near branch apices between spine-pairs on the thorny ridges. 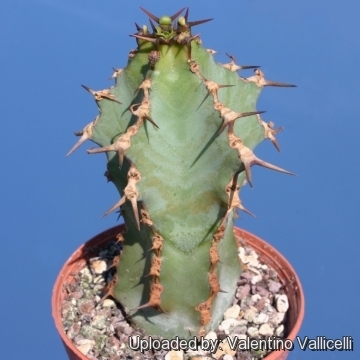 Remarks: May easily be confused with Euphorbia virosa and other large euphorbias. The differences lie in the number of scars left by the cyathia when they fall, the shape of the capsule, and the shape and branching of the stem. 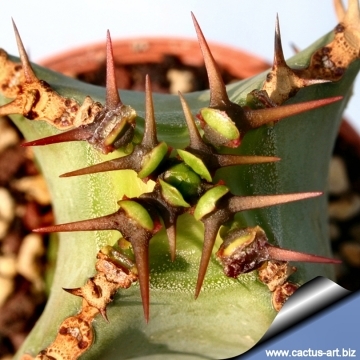 It is particularly similar to Euphorbia avasmontana, but does not grow quite as large, the stem segments are shorter, the crests of the ribs have a dark (as opposed to a light colored) horny chitinous ridge bearing two-pronged 1-1,5 cm long spines, and the colour of the stems is never bluish. It is nevertheless a beautiful species and looks very much like a cactus species. 7) Gibbs Russell, G. E., W. G. Welman, E. Reitief, K. L. Immelman, G. Germishuizen, B. J. Pienaar, M. v. Wyk & A. Nicholas. “List of species of southern African plants.” Mem. Bot. Surv. S. Africa 2(1–2): 1–152(pt. 1), 1–270(pt. 2). 1987. Cultivation and Propagation: It is an easy species to grow that is suited for any well drained soil in full sun. But young plant are happy growing indoors. Give the plant an airy growing medium which mainly consists of non organic material such us clay, pumice, lava grit, and only a little peat or leaf-mould. Water regularly during the active growing season from March to September. No water should ever be allowed to stand around the roots. Keep almost completely dry in winter. It is a moderately fast grower, and will quickly become large landscape masterpieces in just 5-10 years. Only downside is from strong winds, the columns often smash into each other, causing permanent scarring... best to plant in such a location where winds are not a big issue. It is a long lived plant and once established, it will be content in its position and with its soil for years. It can tolerate moderate shade, and a plant that has been growing in shade should be slowly hardened off before placing it in full sun as the plant will be severely scorched if moved too suddenly from shade into sun. Like quite small pots, repot in very later winter, early spring. Frost tender, frost free zones only. Warning: Its latex can irritate the skin and produce a burning sensation in the throat if ingested. Latex irritates the eye and can cause blindness. If contact is made with this white sap, take care to not touch face or eyes before washing hands with soap and water. 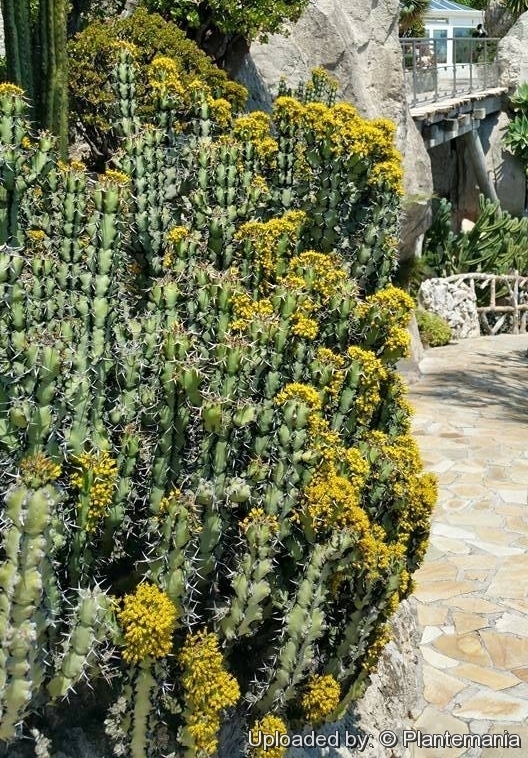 1) Gardening: It is one of many South African Euphorbias that at fist glance look a lot like each other. Very neat habit and makes a good specimen landscape plant in a xeriscape garden. It can be grown in large, rocky, well-drained soil in gardens in drier areas. It is very drought resistant but susceptible to frost. 2) Cattle food: It is used as an animal feedstuff. 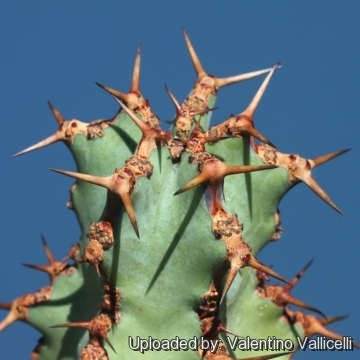 Several more toxic species including Euphorbia franckiana, Euphorbia ledienii and Euphorbia cooperi, are indigenous to the same area. 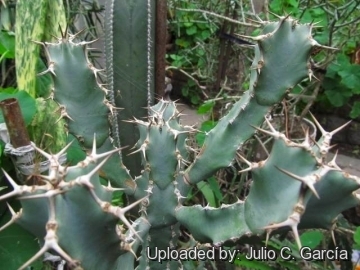 As with the other Euphorbias, its sap is poisonous, but the plant can be used as animal fodder after drying. Although not normally browsed by stock, the plant is eaten when cut into sections and left to wilt for a few days. Apparently the burning taste of the latex disappears, so that the plant becomes palatable to stock. Especially in times of drought it is often used as supplementary fodder.